Stumped for what to get your 6- to 8-year-old? Fret not, fellow parent. We’ve scoped out a wide selection of top gift ideas for a variety of different interests. Here are our top picks. For the storyteller in your family, this is the perfect gift! Thumbprint Portraits provides 30 scenes that are awaiting a story to unfold. Kids can get their fingers inked up (choose from two colors) and press their prints on one of the included portraits… think settings like family travel, summery cookouts, mountain climbing excursions and more. Once set, bring the print to life with the wide selection of stickers featuring clothing, hairstyles, accessories and more. Hours of fun for limitless imaginations! Breathe new life into home economics with this fun gift idea. Alex’s My First Sewing Kit is a fantastic way to teach sewing basics that can last a lifetime. (Buttons never stop popping off shirts no matter how old we get!) A delightfully colorful carrying case is filled with everything a beginner needs to dive into the first project, including a handy illustrated manual complete with patterns. Also included in the kit are pins and needles, a measuring tape, stuffing, felt, thread, buttons, sewing scissors and the mother of all sewing kit needs: the red pin cushion! Throw a big-kid twist on a soothing bedtime experience with Uncle Milton’s Wild Walls series. Select the type of experience—dinosaur, dolphin, safari, and more—and then set the scene. Attach the light and sound wallscape activator to the wall; place each of the decals, which range in size from 18-24 inches depending on the kit, on the wall; and let the magic happen! Kids can enjoy the light show with or without realistic sounds, and the auto-shutoff makes drifting off to dreamland a most wonderful experience. Just like when they were babies! For reluctant readers, Scholastic can help you bring favorite story characters off the pages and onto your child’s walls! The new 13-piece collection of original artwork by renowned children’s illustrators is available exclusively from Scholastic, and net proceeds benefit the Scholastic non-profit partner Reach Out and Read, which promotes child literacy. The characters featured are from popular children’s book series like Harry Potter, Captain Underpants, Diary of Wimpy Kid, SkippyJon Jones and more. Purchase a frame, and your child has the first piece in his own art collection! Shoelaces aren’t just for shoes anymore with Creativity for Kids’ Deluxe Shoelace Crafting Set. Kids can get creative with the 25 colorful laces and use the included loom as their guide. Use the included items (headbands, hair elastics, belt rings and more), or branch off and see where the creativity leads! Additional items included are glue, bracelet clasps, embroidery floss, needle threader and an instruction kit with ideas. For the superhero in your family, this is the must-have gift! The Design Your Own Superhero Cape kit by Seedling contains all the materials a kid needs to create a one-of-a-kind cape and bring a superhero to life! Included are a blank cape, felt sheets, shapes, glitter glue, scissors, colored pencils and a few suggestions to get the project going. Saving the world, however, is completely up to your child! Phineas & Ferb fans will have the time of their lives getting in on the action “before school starts next fall” with this award-winning game. Kids (and yes, adults, too!) can play as Phineas, Ferb and Perry and venture out on a quest to collect items for their Museum of Cool. Play in one of two modes: Exploration mode is a great non-competitive way to check things out, alternating between characters. In action mode, players have to sneak around in Dr. Doofenshmirtz’s lab in an effort to stop the diabolical doc from taking over the Tri-state area. In the midst of it all, players can interact with other familiar characters from the show, including Candace, Baljeet, Isabella and Buford as well as the scrawny, conniving Dr. Doofenshmirtz. Loads of fun for all! If young hands are idle, keep them busy with Animal Hands. 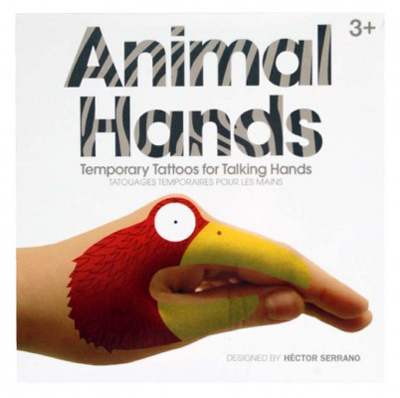 The box of eight temporary tattoos feature friendly, colorful animal faces to apply to hands. Once on, let the animals do the talking and the giggles will follow! The non-toxic tattoos are easy to apply and last long enough to get your fun’s worth. Whether the young lady on your gift list is a dancer or not, she will delight in this musical jewelry box from Lenox. Wind up the music and open the lid to Beethoven’s “Fur Elise.” The ballerina begins twirling as long as the music plays. The metal case on the outside features two hearts and a quilted motif. Inside, store rings or other jewelry items in the upper tray, which can also be removed to feature a larger storage space below for extra special treasures. Combine the timeless fun of paper airplanes with the classic art of origami, and you get this fantastic Origami Aircraft kit from Djeco. Hours of fun await thanks to the easy-to-follow, step-by-step instructions. The pre-printed planes feature fun colors and characters all waiting to take flight when the final fold is complete. The kit can make 20 planes of varying styles. No kid has to run away to join the circus when they get the Moulin Roty Circus Shadow Puppet kit. Kids can employ the help of the 11 different shadow puppets—and their imagination— to bring the big top to life in the comfort of home. Figures include a lion, lion cage, tightrope walker, seal, elephant, a master of ceremonies and more. All your child needs is a light source and a penchant for fun! And speaking of the circus, for those who prefer a more realistic approach to their circus activities, Slackers slackline classic series kit delivers! Setting up the durable, webbed slackline is quick and easy; you can do so between two sturdy trees or purchase the Slackers rack for indoor use or when trees aren’t available. Once you’re set up, it’s time to put your balance skills to the test! The classic series kit includes a 50-foot line and a second beginner line to help steady users while still learning the ropes (no pun intended!). Learning the skill of balance in a fun and easy way? Yes please!